If you’re looking for an impact wrench you may be feeling a bit lost in all of the details and options available. You may not even be entirely sure what it is for and have simply heard that you need one. There are many impact wrenches on the market today, and it’s pretty easy to get lost in all the brand names, models, pneumatic or electric or portable options, and so on. While may know of a specific job they need an impact wrench for, most of us still probably don’t know the best one available for our budget, and that’s okay. We’ve got some of the most highly rated models reviewed here. Most professionals would agree that nothing beats pneumatic drivers when power is really necessary, but this battery powered impact wrench is seeking to change that. Dewalt has somehow managed to cram 1200 ft lbs of loosening torque into this cordless monster, putting it only about 10% below ½ inch air powered impact wrenches in the same size range. While it’s definitely on the heavy side, due in part to having a big lithium battery clipped to the bottom, the ability to have this kind of bolt busting power without being tethered to anything is invaluable when the job demands mobility. Let’s get down to the rest of the nitty-gritty. This needs to be addressed early and remembered well: somehow, this thing puts out 112 decibels. An industrial riveting machine puts out 110 decibels, so this thing is really, REALLY loud! Make sure you use ear protection, especially if you’re using it in an industrial setting in which you’re in enclosed spaces, or your risk of hearing loss is very real. Again, with all impact wrenches you should use ear protection, but this thing is about 20 decibels louder than your average pneumatic, so it’s worth mentioning! Another item that will show up on some peoples’ cons list is the hefty seven pounds this beast weighs with a battery in it. The ergonomics of the handle do go a long way to remedy the weight. It’s very well designed and has plenty of texture to hold onto the tool, but seven pounds is a lot to hold up all day long. If you’re moving into enclosed spaces with the tool—if you’re an industrial plumber let’s say—you’d better have a strong belt to carry this bad boy, especially if you’re bringing multiple batteries! Now that we’ve got the big problems with this tool out of the way, we can get into what it does well. Power is what Dewalt has done well here, exceptionally well for an electric tool and almost unfathomably well for a cordless. 1200 ft lbs of torque of removal power is fantastic, and it really highlights one of the best purposes for this tool: The homeowner DIYer. If you’re doing your own car repairs, and you don’t want to invest in a large air compressor, hoses, and a pneumatic tool, this is THE tool for you. From removing lugs on your wheels to replacing your suspension, this thing will see you through. The usual coverage of parts and labor for defective units is applied by Dewalt here, but they have pushed the term out to three years of coverage instead of the industry standard two, so they get some praise here. Dewalt is absolutely renowned for long tool life and incredible performance, so most purchasers won’t have to think about that warranty for a second. The lack of rebuild kits from Dewalt is lamentable, but not worth complaining about when compared to most other manufacturers aside from Aircat. Battery powered means expanded mobility. Standard warranty is extended to three years. Weighs in at a hefty seven pounds. One of, if not the loudest impact wrenches at 112Db. Warranty only applies to labor and parts of defective units. No rebuild kits are available. As one of the loudest impact wrenches available, this impact wrench by Dewalt has users a bit leery, especially when paired with its seven-pound weight measurement. 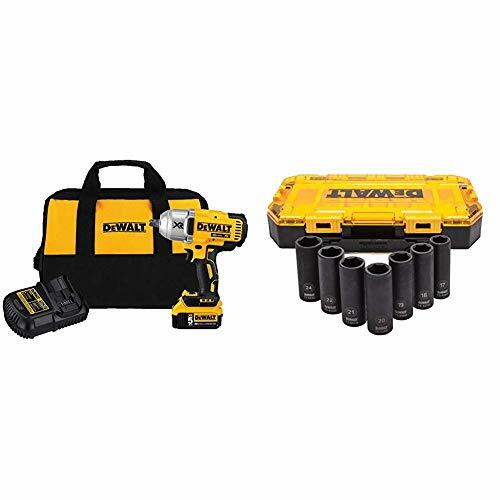 However, when it comes to being able to move around, the lithium battery that causes much of the heaviness is amazing, and even being battery powered, this wrench can boast 1200lbs of loosening torque. 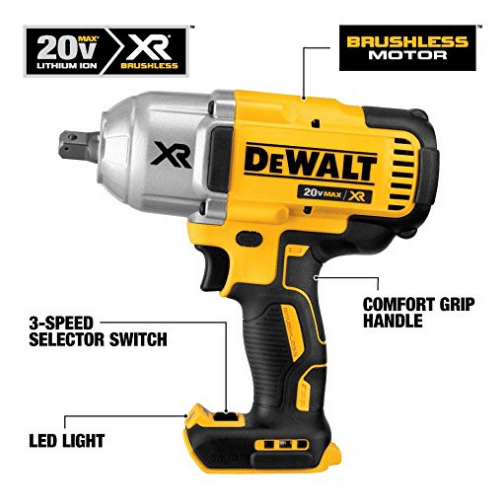 While noisy and heavy, the warranty and reputation of a Dewalt tool definitely apply to this impact wrench, making it perfect for nearly any kind of household project. Ingersoll Rand is a brand name most tool owners have heard of, and for good reason. They’ve made reliable tools for both the home user and professional in the USA for decades, and at the time of writing, this little ½ inch impact wrench is no exception (assembled in the USA with parts sourced internationally). This little beauty features best in class torque, a four-position regulator for precise torque control, and more at a very light weight conducive to extended use. We’ll look at all those features and more in depth, so you can make the most informed decision about your tool. The Ingersoll Rand 2235TiMAX puts out up to 1350 lbs of reverse torque, which is class leading nut and bolt removing power. 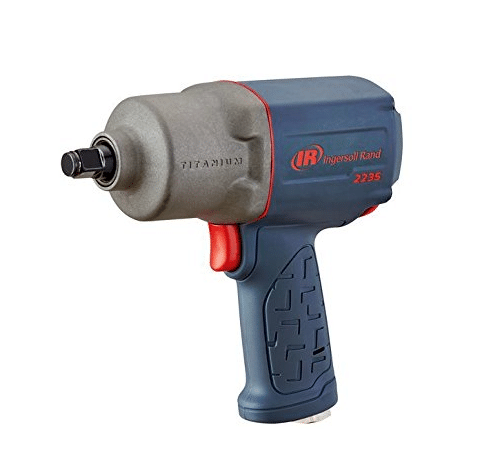 Knowing that that much power would be a little too much for many applications, Ingersoll Rand has included a four position switch to lower the torque, allowing this one gun to be used with a converter on jobs more suited to the power of a 3/8 impact, or even a powerful drill. This is really the killer feature, as it means that one tool can fill the role of multiples, saving you both cash and space in your tool box. Coming in at only 4.6 pounds, this little gun is easy to maneuver and hold for long periods. The texture to the handle allows for a sure grip, though it’s not exceptionally comfortable, and the rubber boot covering the tool is a bit loose. Still, at this price range, these are acceptable compromises for how well the tool performs and will become all but unnoticeable once you get used to it. 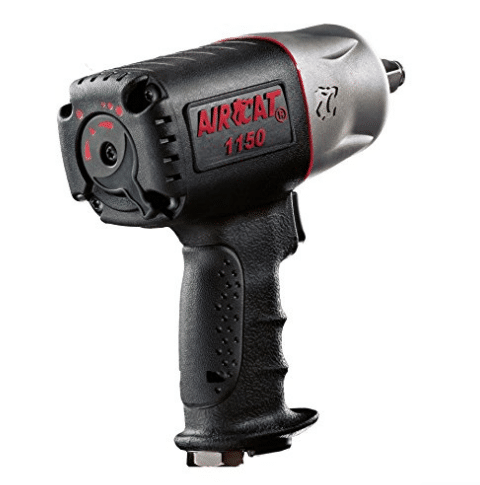 With power comes noise, and this is not the most quiet impact wrench on the market. This model puts out 91.9 db, which is well above the maximum recommended decibel level of 85 to prevent hearing damage. There is another version of this tool that comes with sound reduction technology, and that version drops the decibel level to 88.7 db at the cost of 50 lbs of torque and about $25. It’s up to you whether 4.2 db is worth $25 AND losing a bit of torque, but given that the tool is still rated at 1300 ft lbs of torque, it’s still on the high end of its class. Ever important to professionals is the warranty, and Ingersoll Rand comes through with a solid two years of coverage, but only on defects. This means if you break it or it wears out from use, you’ll need to either pay for repair service or get yourself a new impact wrench. However, this gun has a reputation for a long service life, so most people are more than happy to spend the money once it goes. If you are the unlucky one who gets a lemon, then the warranty will swap your defective gun out for one that meets the standard that everyone who owns these impacts talks about! Ingersoll is a brand with a solid reputation. Features best in class torque, putting out 1,350lbs of reverse torque. Features a four position regulator for precision and amount of torque. Lightweight tool for extended use at 4.6lbs. Not the most comfortable grip due to a textured handle. The rubber boot that houses the motor is reportedly a little loose. Output of 91.9 decibels is well above recommended noise exposure levels. The warranty only covers a defective product, not wear and tear. 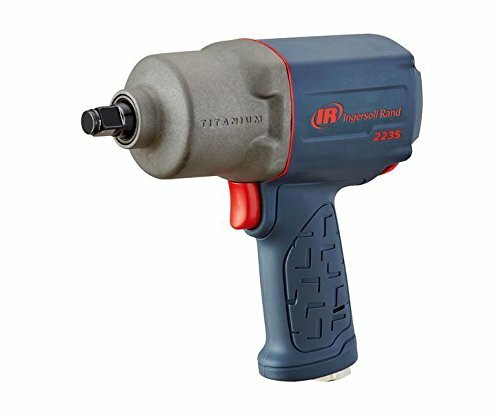 For its price and weight, the Ingersoll Rand 2235TiMAX does play a favorite for many consumers seeking an impact wrench for general use. The noisiness of the tool can be a bit off-putting, and requires that buyers either invest in hearing protection now or hearing aids later, and the warranty is not the most inclusive for a tool that is far more likely to wear out first before breaking, but as far as usability goes, it can’t be beat for price. Aircat isn’t the first name most people think of when they’re selecting their tools, but after owning and using a ¾ inch in a Mazda shop a few years back, I really have to wonder why. This ½ inch holds up to the expectation set by my first Aircat. It’s strong, it’s quiet, and at $155 (on Amazon at time of writing) it’s pretty hard to beat. Let’s take a closer look at how Aircat won me over. 1295 lbs of loosening torque is nothing to scoff at, and a very impressive 1400 blows per minute allows for spinning off even the toughest nuts and bolts like they weren’t even there. The cost of this gun really puts those specs into perspective. It’s got 96% of the torque of the class-leading gun as well as class leading BPM at a price that almost seems too good to be true. However, it is worth keeping in mind that this model only comes with a two position RPM switch, which doesn’t allow for the same range of uses as some competing impacts. Coming in at 4.63 pounds, the Aircat 1150 is easy to maneuver and not too heavy to use for a full day’s work. It’s got a pistol style grip with plenty of texture and a couple of finger indents for a solid, comfortable grip. On the cons side, this impact is prone to vibration when removing stubborn nuts and bolts, requiring the user to brace the back of the gun against whatever you’re socketed onto. For some, this won’t be an issue, but others may find that it bucks a bit more than they’re willing to handle. I’ve also seen some people say that when the PSI at their shop is in about the 150 PSI range that the trigger becomes very touchy, but I haven’t been able to test at that pressure to confirm that. Aircat’s “Patented Quiet Technology” is actually extremely impressive. This model only puts out 86 decibels of sound! When compared with other guns in this range averaging around 90+, and just 1 decibel over the recommended exposure without ear protection, I’ve yet to find a competitor that can match the comparatively silent Aircat 1150. Some will say that you need ear protection with this gun, but if you’re working at home or in a pretty populated area you already know the value of lowering your noise output! Nothing outstanding here, unfortunately. Aircat warranties their impact wrenches for two years, parts and labor, for defective units. 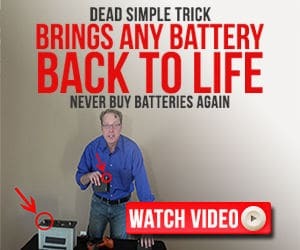 So, if it breaks on you during normal use, you’ll have to pay for the repair. The good news is that Aircat sells rebuild kits for their impact wrenches for the DIYer looking to save some cash, or the expert not afraid to get their hands dirty. This is definitely above and beyond what most companies do, which helps make up for the boringly standard warranty coverage. 1295lbs of loosening torque, and 1400 blows per minute. Solid grip with indents for fingers and texture. Aircat offers a rebuild kit. Only two settings available to control RPMs. The gun’s trigger is reportedly touchy at the higher PSI range. Only the parts and labor for a defective unit are warranted, for two years. 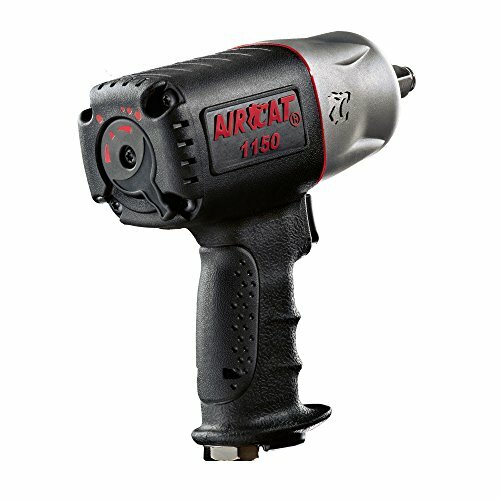 The Aircat, at just over $155 is one of the best impact wrenches to spring for. Noise levels alone make this a favorite among common impact wrench users, while the weight and grip help to offset the vibration that can be notable. A two position RPM switch isn’t the best, but also isn’t a deal breaker, as most people like the simplicity of either a high or low setting. Even with the more standard type of warranty, the rebuild kits available for this model have made it vastly popular, especially as such a solid little impact wrench. An impact wrench is the powered version of a wrench, often used in the automotive repair world to loosen the lug nuts of trucks and cars. But it can really be used in any situation that requires high torque such as a major project in the construction field, a home building or repair project, product assembly (perhaps a desk or other very sturdy shelf might use this), or large, heavy equipment pieces that need maintenance. The impact wrench is a socket wrench that is designed to minimize the exertion a person would have to use to twist off a nut or bolts. In most cases, projects that recommend an impact wrench are impossible to do with a regular hand powered wrench. If you’re starting a hunt for your own impact wrench, keep the following parameters in mind to help you find the best one for you and your project. Most of the time, you’re going to want to have hearing protection when using any power tool, but this is especially relevant for those using impact wrenches. It is also important to keep in mind for home owners and businesses that have neighbors nearby. Most impact wrenches reach a noise decibel that is outright damaging to one’s hearing (which is why you need to wear protection). Think of the “whirr” sound you often hear coming out of an automotive shop. You can hear that from pretty far away, so imagine being on the operating end of the tool causing that sound – that’s an impact wrench. An impact wrench that puts out significantly more or less noise than others may have a special appeal to you if your neighbors are the noise complaint kind, or if you’re already at risk for hearing problems. Truthfully, less noise is better, and ought to be a key component when shopping. How long are you going to be using your tool? How small of a space does it need to get into? How much mobility do you need to have when using it? These are all vital questions when you’re pinning down the perfect impact wrench for your needs, since these tools vary significantly in weight. You need to be able to comfortably hold the tool up for as long as your work demands, so while a DIYer may be able to compromise on the heft of a tool, professionals may want to think twice about what they’re willing to deal with since their use will be more frequent and for longer periods of time. An added complication to the weight and heft element is that many use compressed air as one of the most popular power sources. Both DIYers and professionals should keep in mind how problematic it is for an air hose to be attached to them whenever they are trying to use the tool. Since operators often need to hold the wrench pretty high and at awkward angles, it will take a lot of strength and endurance to keep a heavy drill in the right place – it will definitely wear your arms out. A lighter tool, then, is ideal, as an impact wrench will often be used in quick succession to remove nuts and bolts, so maneuverability is a must. You don’t want to struggle to move it from place to place, otherwise you’ll have defeated the efficient part of the tool altogether. Making sure that the impact wrench is up to the task at hand may seem like common sense, but sometimes it’s easy to get taken in by the marketing of something as “powerful” despite the amount of power it really has. It can also be easy to get lost in the numbers and not do further digging to make sure the kind of power you need for your job. 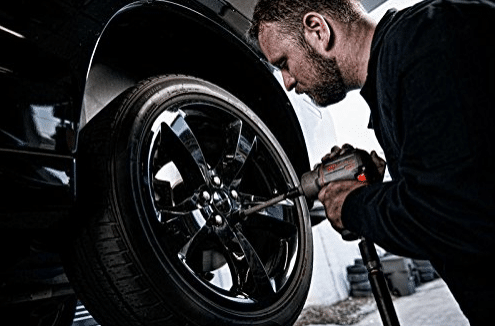 Unscrewing tuff bolts that hold a rim and tire onto a car, for instance, will need a lot more power than someone assembling or disassembling a shelving unit. You’ll want to carefully look at the specifications, and maybe read some reviews to see if anyone has used the tool for the purpose you have in mind. No one wants to invest the kind of money that these tools cost and not even be able to use it! Impact wrenches are generally considered powerful, but is it the power source that makes it best, or the torque it can put out? What do you need your impact wrench to do? What about its construction? You’ll want to look for on that is more durable and has tell-tales of sturdier construction. Make sure you really identify the torque that the wrench you are interested in produces and see if anyone else has used it for what you want it for. The industry standard warranty is two years parts and labor on defective goods, so if it’s shorter than that be cautious, and if it’s longer enjoy your peace of mind! If you can somehow find a tool that covers more than defects, grab it up before the manufacturer comes to their senses. Some brands also offer to supply replacement parts, and while not all of us are up to repairing our own tools, having the parts available helps reduce costs for those of us brave enough to open the tool.